A lot of the restaurants I will post in the coming future will likely be difficult for me to translate into English. Please bear with me! I’ll do my best with pictures and Google Maps to identify the places for you. 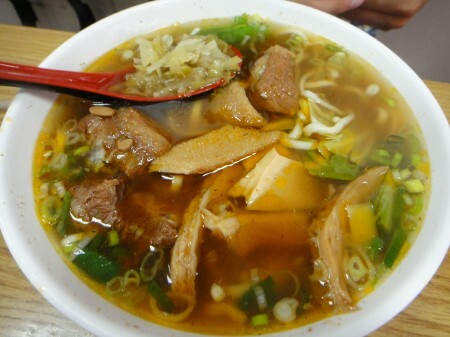 The first restaurant we went to in Taipei city was a noodle shop close to my grandmother’s apartment. We ordered a beef tenderloin noodle soup and a pork turnip noodle soup. Food came out a few minutes after we ordered and tasted great too. Having gone with natives of the country, we didn’t think to give our bodies time to adjust to the local food. Either that or we got a bad batch of noodles. In this, both my brother and I had upset stomachs that evening and had to stay in bed for the entire next day. So my advice to you is to stay away from greasy/oily soups your first couple of days in. For dessert, we went to the basement of the Mitsukoshi department store where they have a stand that sells traditional Taiwanese cold sweets. The rough translation of its name is shaved ice. First you choose a kind of tofu – almond or regular. Then you choose from a variety of mixins: tapioca balls, sweet noodles, fruits, red beans etc. To top it off, shaved ice is added with a ladleful of sweet syrup. Tags: Beef, Cheap, Dessert, Fast, Ice, Noodles, Soup, Taipei, Tapioca, Tenderloin.